The Philippine Legislators’ Committee on Population and Development, in partnership with the UN World Food Programme-Philippines (WFP), conducted a policy forum entitled, “Ways forward: Sustaining the policy agenda on food and nutrition security for the next government,” at the Sulo Hotel in Quezon City on April 27. 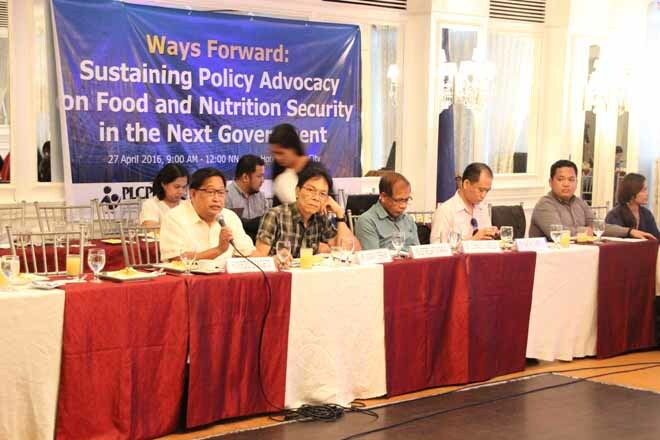 The forum brought together lead government agencies, Congressional committees, and civil society organizations to discuss pressing food and nutrition security concerns and contribute in drawing the policy agenda for the 17th Congress. Dr. Martin Parreño, WFP’s Nutrition Programme Officer, discussed the interrelationship between food and nutrition and health, stressing that arresting nutrition security challenges such as malnutrition, water and sanitation, healthcare, will immensely contribute to food security. To highlight this need, he further shared that over 6% of the country’s GDP is lost to malnutrition as it hampers productivity. Thus the government needs to seriously undertake measures to promote food and nutrition security. Meanwhile, Dr. Domingo Angeles, chair of Interdisciplinary Studies Center on Food and Nutrition Security at the University of the Philippines Los Baños (UPLB), focused on food security and its pillars—availability, accessibility, stability, and utilization. The absence of even one in the equation will hamper the goal to end hunger and malnutrition. Dr. Angeles shared strategies to help promote food security, most of which were pioneered in UPLB, such as product diversification, support for research and development, and encouraging the youth to invest in farming as a viable profession. As a form of response, government agencies shared their programs and policies to address challenges to food and nutrition security. Undersecretary Rosalina Bistoyong of the Department of Agrarian (DAR) reform shared that DAR just started a partnership with WFP to help farmers, especially in disaster-prone areas, to increase productivity and help expand and ensuring a fair market for them. Meanwhile, Department of Agriculture representative Ulysses Lustria emphasized the Philippine Development Plan 2011-2016 framework, which centers on productivity in agriculture and fisheries, making growth inclusive for all basic sectors. Congressional Committee Secretaries Cecilia Reyes (Food Security), Consolacion Galang (Agriculture and Food), Rita Macabulos (Agrarian Reform), and Service Director of the Congressional Planning and Budget Research Department Novel Bangsal also responded and shared legislative proposals that seek to address food and nutrition security issues lodged in their respective committees. These policies center on agricultural and fisheries modernization/mechanization, development of other industries such as sugarcane and coconut, proper land distribution and acquisition, strengthened support and investment for farmers, and promotion of health and nutrition in the first 1,000 days, among others. Civil society organizations, Philippine Network of Food Security Programs in the Philippines and the Philippine Rural Reconstruction Movement, both represented by their heads, Ms. Estrella Catarata and Mr. Isagani Serrano, respectively, also shared perspectives to achieve food and nutrition security. These are through community-based initiatives, investing on climate resilient and high value crops, organic farming, closing the information gap, and pushing for policies that will push forth food and nutrition security. Ultimately, the following areas for reform were identified and discussed by speakers and participants in the forum: reforms in governance structures necessary to foster convergence for a more comprehensive policy framework; interventions in promoting food and nutrition security in terms of programs policies and policies; and funding necessary to ensure investment in agriculture to help attain food and nutrition security.